My first trimester was rough. Seriously with both boys I developed a super hero’s sense of smell and had to wear two face masks when cooking. It was HELL. I had one charcoal face mask and then a plain one with a vent for breathing. Yes, I seriously wore these and my sea-bands every day for 3 months. With Bubba I could not eat any carbs. Like none. No rice, no potatoes, no banana. BANANAS! I literally had to run to the bathroom when I had banana. It was the first time I had successfully done Keto and while I love me some fat, the carbs thing was a total bummer. However one of the many gems that I discovered during this time was Plantains. I remember buying some from the grocery store thinking, why not? I whipped up some plantains fried in coconut oil and I did NOT get sick. I was deliriously happy . 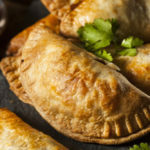 I had only thought of using plantains in sweet dishes and this Plantain Empanada recipe is savory fried goodness. Bonus points, it’s also AIP. Place a large pot on your stove on medium high heat. Slice the peeled plantains in half and place in the water. Cook for 25 to 30 minutes. Remove from the water and place the plantains in your food processor. Pulse until smooth. Remove the dough from the food processor and place in a bowl and let sit for 4 minutes. It will firm up. Pinch a golf ball size of dough and place between two sheets of parchment paper. Roll until you have a 6" diameter circle. Place whatever filling you want inside. Fold the dough in to a half circle pinch the seams. Repeat until you have used all the dough and set aside. In a frying pan, heat the coconut oil and the place the empandas in two at time and frying until golden brown, roughly 3 to 4 minutes and flip and repeat. Remove from the pan and place on a paper towel. Repeat until all the empandas are cooked. 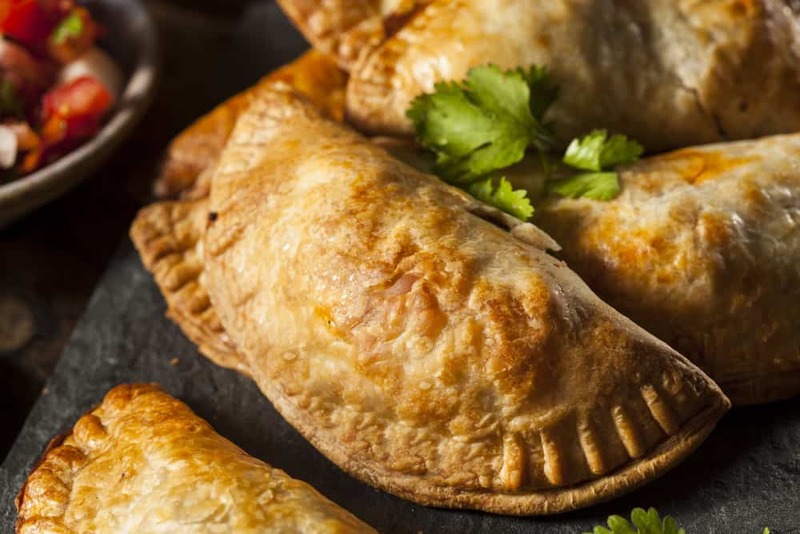 I love empanadas and can’t wait to try these. If I am using the instant pot to cook the plantains, what setting and long do you think these should cook for/at? Hey Marla, I have never cooked them in the instant pot hun so I’m not sure. SOrry! Do you think I could bake this instead? I’m not sure what the bake time would be but I think that would work. I would start at 350 degrees for 25 minutes. This recipe is genius! Seriously. I was very hesitant to make this as I have previously made plantain waffles and they were very… plantain-y. But boiling them first makes them sooooo good. Perfect dough, easy to work with. Used leftover dough to make scallion pancakes, which were so good that I ate them up consecutively as they came out of the pan. So glad you enjoyed them Emily!